Spring brings so may things, the gardeners begin outdoor cleanup, spring cleaning commences inside, lawnmowers replace snowblowers, and those of us who love to paint en plein air head outside. I'm lucky this spring to be able to do that on the New England coast all the way from Westport on the southern shore of Massachusetts to Rockport on Penobscot Bay, where I'll be tomorrow painting with Carol L. Douglas. And yes, we will be in a boatyard, just as I've been today helping to get our boat, the Fair Tide, ready for launch. 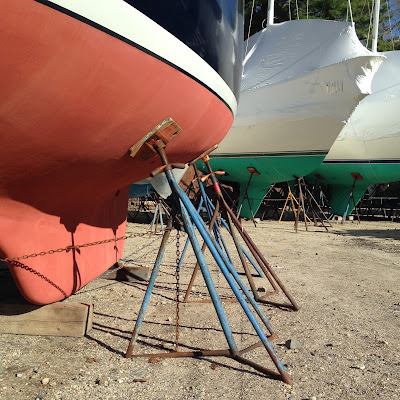 I love hanging around in boatyards, there's lots to see, and usually lively conversation. And everyone is working. I wish my house was a clean as the sparkling wheelhouse of the lobster boat that is parked in front of ours! ready for me to roll up and put in the dumpster for recycling. Jack stands holding up a sailboat while stored at the boatyard. But back to the top. 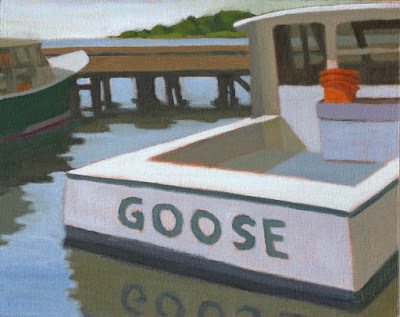 Goose is a lovely lobster boat that lives in Westport Harbor, manned by Captain Mike and his little dog, Goose. I'm not sure who is named after whom. There used to be another goose in Westport Harbor, who was a friend of the local swan. But this year the swan arrived with a lady swan, and that particular goose is no longer welcome. All the best to you and whatever spring brings your way. One of the most popular books in American children's literature is Make Way for Ducklings by Robert McCloskey, about a mother duck and her babies and their walk around the streets of Boston. This book provides the title for an exhibit at the Museum of Fine Art in Boston of original sketches, drawings, and paintings from McCloskey's books. And it's a delight for those of us who love the work of this author illustrator. 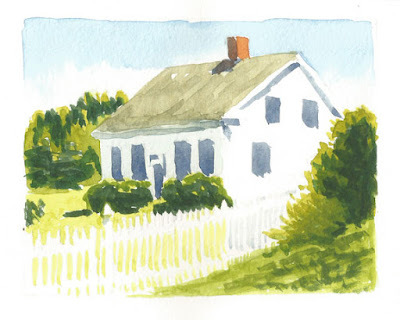 In our family the favorites were Burt Dow, Deep Water Man, Blueberries for Sal, Time of Wonder, and One Morning in Maine. The illustrations in McCloskey's early books were drawings, due to the high expense of publishing in color during WWII. The originals of those drawings shown in the exhibit are simply beautiful, and the paintings which appear in later books are lovely. I may have to go back and see it again before the exhibit closes on June 18th. 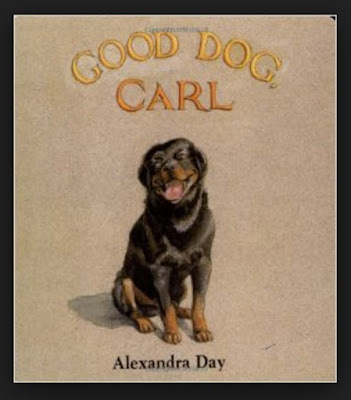 Seeing the McCloskey exhibit brought to mind another children's book whose illustrations I loved when our son was young, Good Dog, Carl. The story is told by the illustrations, there is no text, which makes it great for non-readers. The pastel illustrations are beautifully done by Alexandra Day (Sandra Louise Woodward Darling). I just discovered that since Carl was a good dog in 1985 there have been 14 more Carl books published. I've got some non-reading to do! 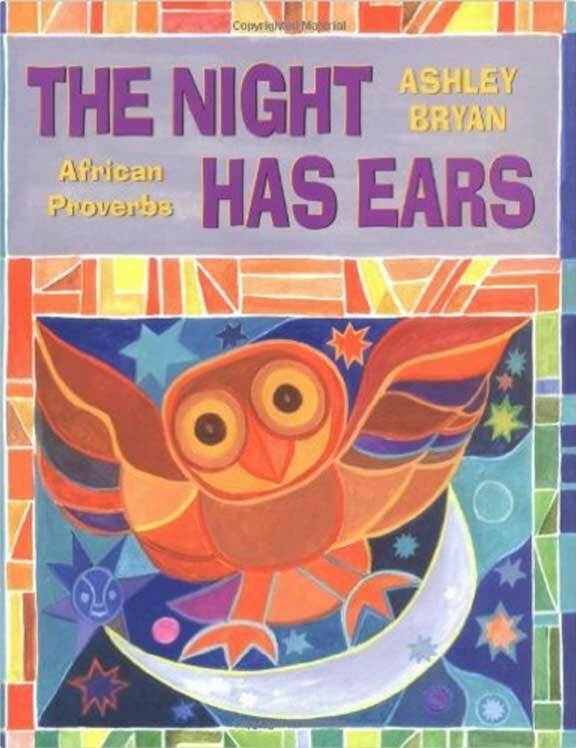 And finally I'd like to tell you about the latest author illustrator that I've become acquainted with, Ashley Bryan. I came to know of Bryan through his friendship with Henry Isaacs, and had the pleasure of hearing them speak together. His paintings are rich and colorful and I'm just starting to dip into his books. The first black student at Cooper Union, Bryan recognized a void in African American children's literature which he has filled with 50 books. Last spring when I was in New York City, I immediately recognized his work commissioned for several subway stations. What a treat! Bryan has work in the current show at Greenhut Galleries in Portland, ME. 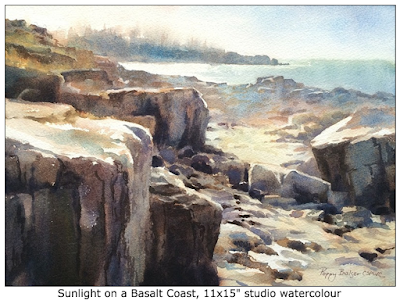 Thanks to Bruce McMillan for his explanation of the illustration publishing process. I got an email the other day from a colleague in my former technology life. It said "it looks like you are having more fun than anyone I know". And I think she's right. It's because I get to learn something new every day. Here's a case in point. Haven't you heard it said that watercolor is harder than oil and acrylic? In my experience it's true. 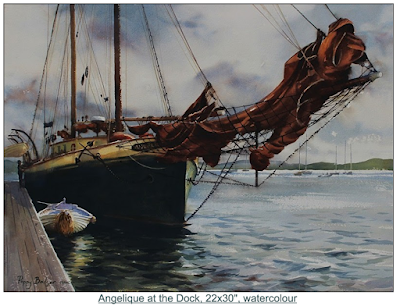 But there are some scenes that just call out to me for watercolor, particularly those on the water. Winslow Homer's Caribbean paintings come to mind. I also think we learn a lot when we work in more than one medium. 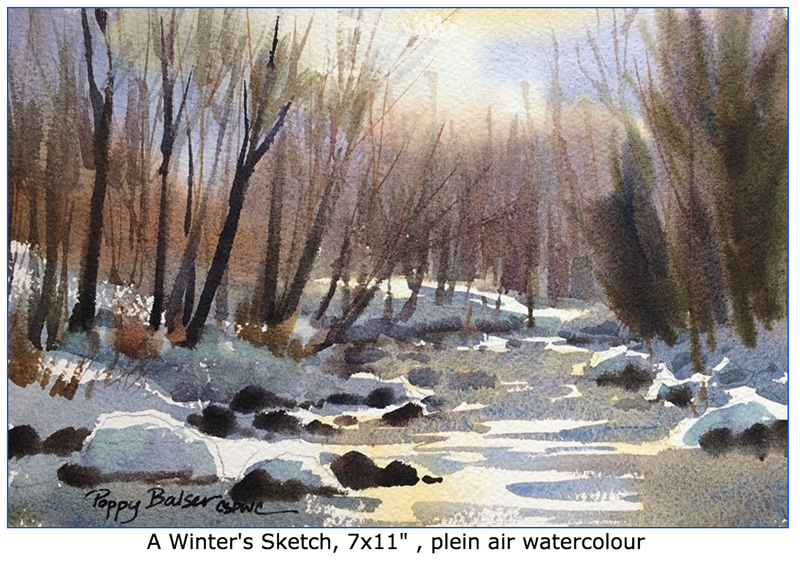 So I'm excited to be attending a workshop next month with accomplished watercolorist and friend, Poppy Balser. To add to the appeal, it's in Cornwallis Park, Nova Scotia! Here are a few of Poppy's water colors, which are inspiring indeed. Poppy's workshop in May is full, but she's teaching again in June and September. For more information take a look here.